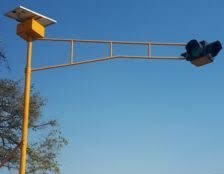 TWO Chitungwiza men have appeared in court for stealing the town’s only traffic light during last week’s demonstrations led by MDC-Alliance and its civil society allies. The demonstrations, falsely billed as peaceful, degenerated into a spree of looting, arson and criminality during which a Choppies supermarket lost $400 000 worth of goods in Chitungwiza, amid nationwide carnage. Takemore Bhunu (27) of Glen View 3 and Godsave Mukore (25) of Chitungwiza appeared before Chitungwiza magistrate Mrs Blessing Murwisi yesterday and were remanded in custody. They pleaded not guilty. The pair claimed the Zimbabwe Republic Police (ZRP) “planted evidence” against them as they were at home when the alleged offence was committed. Their trial continues today with two witnesses expected to testify. Ms Tendai Shonhayi prosecuted. The prosecution is alleging that on January 14 at around 1100hours, Gabriel Kawara (42), who is employed by Choppies Chitungwiza Town Centre branch, closed the supermarket following threats of violence. At around 9am, Bhunu, Mukore and accomplices still at large, armed themselves with stones, logs and iron bars and barricaded Mharapara Road at C-Junction with burning tyres. They destroyed the traffic lights at C-Junction. They took the traffic lights with them. The two proceeded to Choppies Supermarket where they forcibly opened the doors and stole goods before fleeing the scene. Police investigations revealed that Bhunu and Mukore sold some of the goods to passers-by. They hid some along a stream behind Tafa Shopping Centre in Unit D. Kawara later received information about the looting and made a report to the police.